EA LOVES : #ealfridayfeaturing... Niall Fallon and Dr K's beard care set! 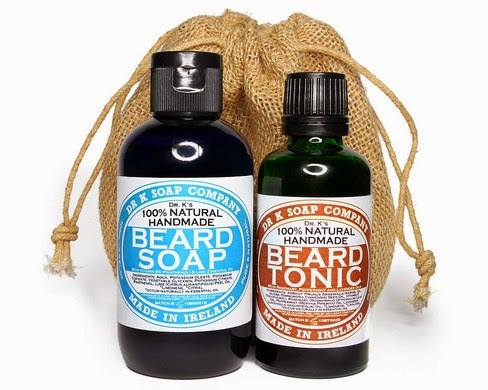 #ealfridayfeaturing... Niall Fallon and Dr K's beard care set! Much has been made of society reaching peak beard in 2014 as thick facial hair has become the #1 sartorial accent for male models and skinny-jean wearing trendies alike. Although this association can be quite annoying for those of us who have worn beards for years (either out of laziness, fear of the cold...), it has lead to an fortuitous explosion in the availability of beard grooming products. I'm no expert, but I know what I like. Dr K's Beard Soap is has an intense citrus scent, which when combined with it's impressive lathering action provides for a refreshing cleanse. Personally I really enjoy the strong lime hit, but if that is not your "flavour of choice" it might be one to avoid. Dr K's Beard Tonic forms an ideal combo with the soap, enhancing the refreshment with mint and lavender. The fragrance aside, this Beard Tonic softens and conditions an unruly beard when massaged in and combed through. The tonic is supplemented with Vitamin E oil, which google tells me should promote healthy hair growth. Bonus! If you want some beard grooming products to tame the mane, and you fancy a bouquet of essential oils, look no further than Dr K.